A giant portrait of Kim Jong-un has gone on display in public for the first time, in what analysts say could be a sign of a turning point in the current North Korean leader’s status within his country and a message to the international community. The portrait was spotted at events both welcoming and bidding farewell to Cuban President Miguel Diaz-Canel at Pyongyang International Airport this week. It was hung next to Diaz-Canel’s portrait, painted in a similar style, according to photos released by the North’s state media. Its features were also strikingly similar to the official portraits of Kim’s father, Kim Il-sung, and grandfather, Kim Jong-il, which are found in both public and private venues across the country. With his rise to power in late 2011, there were views that Kim Jong-un, as a third-generation hereditary leader, would not be able to earn the same respect from his people as his predecessors. Therefore a political purge followed, including the execution of his uncle Jang Song-thaek, and all those who allegedly contributed to resistance against Kim, according to some experts. Now, almost six years in power, Kim is ready to expand his cult of personality, experts say. “The portrait is making it official that he is North Korea’s ‘supreme leader,’ with equal power to his father and grandfather, especially unveiling it during a diplomatic event,” said Ahn Chan-il, a North Korean defector who heads the World Institute for North Korea Studies. Badges with portraits of the North’s two former leaders are proudly donned by North Korea’s ranking officials, envoys, and delegates. They were spotted on North Korean athletes and members of its art troupe during the PyeongChang Winter Olympics held in South Korea earlier this year. Ahn also attached significance to the timing of the portrait’s emergence amid a tug-of-war between the US and the North over progress on Pyongyang’s denuclearization. The US State Department announced Wednesday that the planned meeting between US Secretary of State Mike Pompeo and his North Korean counterpart Kim Yong-chol, a senior ruling party official, has been postponed. They were to meet in New York on Thursday. “Cuba is like a diplomatic role model for North Korea. It is a socialist country that was mired in a military conflict with the US with the Cuban missile crisis during the Cold War era, but eventually restored diplomatic ties (in 2015) without being dragged along by the US,” he said. 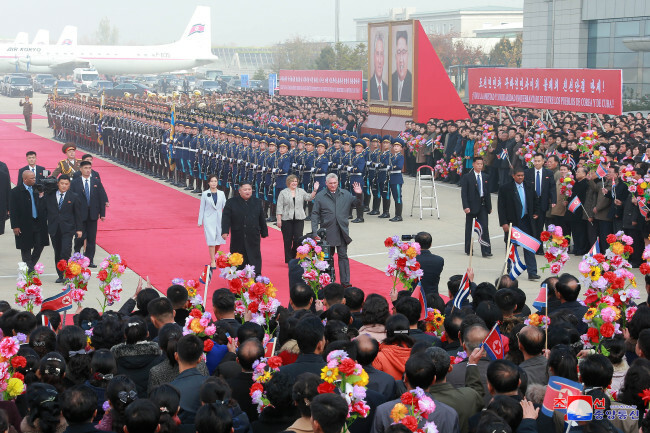 Diaz-Canel left Pyongyang on Tuesday, wrapping up his first state visit to North Korea.